This Revelation Timeline Decoded Bible study focuses on the earth beast of Revelation 13, the Jesuit Generals of Rome, the False Prophet. Many people teach that the earth beast is America, but remember that the last beast of Daniel is Roman. It has changed forms over the years from the Roman Empire, to the Popes of the Roman Catholic Church which reigned for 1,260 years from 538-1798 A.D., to the Jesuit Generals who took control of the Vatican and are using it to gather the world under their power. Summary: The Jesuit General caused Napoleon’s army to capture the Pope and take him prisoner in 1798 A.D., ending the reign of the Popes of Rome. The top Jesuits pretend to be Christians (lamb-like), but they worship Satan the dragon. Jesuit priests have spread around the world to now cause 1.2 Billion Catholics to revere/worship the Pope. And Jesuit Pope Francis is now drawing Protestants, the Orthodox Church, Muslims, and all people groups under the power of Rome. The Jesuits control the city-state of the District of Columbia, through which they control America. They use their intelligence agencies and the American military, to take control of the other countries of the world, which is why America has military bases around the world, and why America is almost always involved in some sort of war. The Popes rose to power out of the 10 kingdoms, thus the water/sea reference. The Jesuits rose to power out of the Vatican, which is the earth that is being referred to. The Greek word is ge; contracted from a primary word; soil; by extension a region, or the solid part or the whole of the terrene globe (including the occupants in each application):—country, earth(-ly), ground, land, world. It’s telling us that this reigning power would rise up out of the previous reigning power, and that is exactly what the Jesuits did. As a beast has already been shown to be the symbol of a reigning empire, the rising up of this second beast must consequently represent the rising up of another form of the Roman beast. This beast did not rise up out of a people group (Popes rose up out of a sea of people), but were created by Ignatius Loyola. The Jesuits are the military order of the Vatican who were empowered at the Council of Trent in 1545 A.D. to counter the Reformation, to bring Protestant Churches back under their power and to kill the followers of Christ. When the Roman Catholic Church lost its power in the 18th century, the Jesuits seized control of the Vatican. Ascending out of the earth denotes his rise from a small beginning to a mighty height. The Society of Jesus started with one man, Ignatius Loyola, and has grown into an army of priests who are subservient to the Jesuit General, who have been trained to carry out his orders without question. This beast is called the false prophet, (Rev. 19) than which there cannot be a stronger or plainer argument to prove that false teachers were particularly designed. Like the title of ‘Antichrist,’ the name ‘False Prophet‘ represents a position, not just one person; much like the President of the United States or the King of England. The False Prophet represents all of the Jesuit Generals, Black Popes, who lead the Society of Satan to deceive the world with their sorcery. The Jesuits act Christ-like (lamb-like), but spread around the world teaching a false salvation message of following the seven sacraments through the Papal Church. The Jesuits are the source of false prophecy teaching of a future 70th week of Daniel featuring a one-man antichrist, and a futuristic fulfillment of Revelation; as to deflect blame away from the Roman Church. Coke’s Commentary on the Holy Bible says “For the false prophet no more than the beast is a single man, but a body or succession of men, propagating false doctrines, and teaching lies for sacred truths. Horns represent leaders, so it is saying that this form of the Roman beast would have two key leaders. We can clearly see that the Black Pope controls the White Pope, since the Jesuits took control of the Vatican in the last 18th century. The Jesuit Order is a military organization. They infiltrate countries under the guise of being priests, but they work to gather intelligence through the confessions of the leaders of countries. Then they use the intel to find corrupt people that they can use, to blackmail people into carrying out their orders, to take control of countries. They call themselves the “Society of Jesus” and on the surface they appear to be priests who spread around the world ministering, but behind the scenes they serve Satan and they subversively do his work. They are lamb-like in pretensions, but dragon-like in character. The Jesuit General, the Black Pope, controls the Vatican, not the white Pope, which everyone sees. They do not take credit as the leader, rather they work behind the scenes to hide their power. They are using the authority of the Roman Catholic Church to draw the world under their power. The Jesuits of Rome are empowered by Satan, and they are using the power of the major military’s and intelligence agencies, especially those of America, to make war with other countries, to push the world into the their New World Order, where Satan will be worshiped. 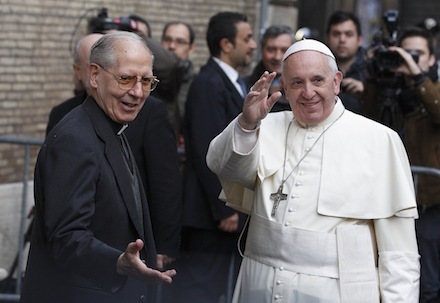 Father Adolfo Nicolas, Jesuit superior general, welcomes Pope Francis as he arrives to celebrate Mass at the Church of the Gesu in Rome Jan. 3. The pope celebrated Mass with 300 of his Jesuit confreres in thanksgiving for the recent canonization of Jesuit St. Peter Faber. Coke’s Commentary on the Holy Bible says “He holdeth imperium in imperio, an empire within an empire; claims a temporal authority as well as a spiritual; and enforces canons and decrees with the sword of the civil magistrate. As the first beast concurs to maintain his authority, so he, in return, confirms and maintains the sovereignty and dominion of the first beast over his subjects; and causeth the earth, and them who dwell therein, to worship the first beast. John Gill’s Exposition of the Entire Bible says “to worship the first beast; to be subject to the temporal power of the Papacy, or to submit to the pope as a temporal lord, to give homage and tribute to him, and the like, in order to support his worldly power and grandeur; and this was caused or brought about by his emissaries, his spiritual vassals, his legates, cardinals, priests, etc. by their exhortations, persuasions, and commands, delivered both in writing and preaching. In 1917 A.D, the Jesuits caused an event where 70,000 witnesses supposedly saw the sun, contrary to cosmic laws, twirl in the sky, throw off colors and descend to earth. This event, which occurred in Fatima, Portugal, caused even non-believers to immediately dropped onto their knees and beg for forgiveness. That ‘Miracle of the Sun‘ supposedly confirmed the validity of the “Message of Fatima,” a message from the Virgin Mary, which gave warning of future calamity if people did not participate in the Eucharist communion. It served to draw the Muslim community towards the Roman Catholic Church, as they too revere Mary and believe that she was speaking through Fatima, the daughter of Muhammad. Or it could refer to a future deception from the Jesuits using HAARP or other technology to cause fire to come down from the heavens. Since 1798 A.D., the Jesuits have propped up the Roman Church, creating an image of what it used to be. In 1929 A.D., at the Lateran Treaty, the Jesuits caused the leaders of Italy to establish Vatican City as an independent state, giving her civil power again. Since then, Jesuits have spread around the world teaching the false Catholicism message of salvation, so that now 1.2 Billion Catholics revere the Pope. In Pope Francis the Jesuits have taken the White Pope position, as Pope Francis is the first Jesuit Pope. He is gathering Protestants, the Orthodox Church, Muslims, and the whole world under his power. So in effect, the Jesuits have created an image of the beast. They have created a power structure in the form of the Catholic Church, which they have revived. They are using it to gather the world under their control. It could refer to a future deception from the Jesuits using satellites such as Project Blue Beam, which is designed to create holographic images in the sky, to create a worldwide message supposedly from God, or Mary. Coke’s Commentary on the Holy Bible says “In short, he is the most perfect likeness of the ancient Roman emperors; is as great a tyrant in the Christian world, as they were in the Heathen; presides in the same city; usurps the same powers; affects the same titles; and requires the same universal homage and adoration. saying to them that dwell on the earth: the apostate church, or the carnal inhabitants of the empire: ordering and commanding them. They are using Pope Francis, who is a Jesuit, to draw the world unto the “universal church” and those who don’t unite with her are becoming the enemy of the world. Look at the recent history and you see that the leaders of countries who would not bow down to the authority of the Jesuits, who did not have a Jesuit-Rothchild central bank; were killed and their country is now in chaos where many have died. Recall them demonizing Saddam Hussein to justify military action in Iraq. Saddam was killed, the oil and gold were stolen, more than a million Iraqis died, a Rothchild central bank was set up to control their money supply, and Iraq is in shambles. Recall them demonizing Muammar Gaddafi, to justify military action in Libya. Muammar was killed, the oil and gold were stolen, many Libyans died, a Rothchild central bank was set up to control their money supply, and Libya is in shambles. Look at how they have demonized President Assad in Syria. They have inserted militants in Syria to cause a civil war. They have inserted the CIA-created ISIS into Syria to fight against Assad. And now the militaries of America, France, Russia, Israel, etc., are engaged in destroying Syria, because they have not bowed down to the authority of the Jesuits. Look at how they demonize Iran, who has not attacked another country in 200 years. They are setting the stage for a future attack on Iran. They have to control the money supply of every country, in order to control the world. These False Prophets now deceive 1/6th of the world’s population with a false salvation message. These people have the mark of the beast on them, as they obey the commands of the Pope and trust in him for salvation. And the Jesuits are drawing Protestant Churches to the Papal Church, along with Muslims and people of all religions. The Jesuits covertly control the World Bank, the International Monetary Fund, the International Bank of Settlements, the Federal Reserve Bank, and Central Banks in almost every country. In their New World Order, they will control the monetary system, to dictate who buys and sells. Note: The Jesuits use Zionist Jews to control many areas of finance, as they use them as a front organization, so that if the world wakes up to see that they have had their wealth stolen, they will blame the Jews, instead of the Jesuits. The Pope’s title is Vicar of Christ, which in Latin is ‘Vicarius Filii Dei’, which equates numerically to the number 666. Coke’s Commentary on the Holy Bible says “No name appears more proper and suitable, than that famous one mentioned by Iraeneus, who lived not long after St. John’s time, and was the disciple of Polycarp, the disciple of John. He says, “that the name Lateinos contains the number six hundred and sixty-six. Here are some prophecy explanations of the earth beast of Revelation 13 from as far back as the 5th century, which describe the Jesuits of Rome, which of course did not even exist yet. Primasius, Bishop of the Carthaginian province, in his 6th century “Commentary on the Apocalypse” lays stress on Antichrist’s affected impersonation of, or substitution of himself for Christ; and blasphemous appropriation to himself of Christ’s proper dignity. That of course refers to the first beast of Revelation 13, the Popes of the Roman Catholic Church, who call themselves the Vicar of Christ, the substitute of Christ. They proclaim to forgive sins and that salvation is only through the Catholic Church. This video lists the many quotes about the Jesuits of Rome, from people who were warning us about their Satanic agenda. Praise the Lord! Hope you are well brother David. Thank you for your service and devotion in the Lord’s vineyard. May I ask, do you believe that the great tribulation started during the inquisition? I ask this because the Bible talks of a great tribulation before the end of the age and history shows that the inquisition was responsible for the death of millions of christians. I seek to learn and grow everyday. Amazing research with historical accuracy and references. I can’t wait to read more, and see more videos. I was half listening to the news last night and there was a report from England showing Catholics pilgrimage through a town (sorry didn’t catch the name) for the first time since it was stopped at the time of the reformation in the 1500s. There were protestors there and the reporter asked a man why he was protesting. He said something like “the Catholic Church worships satan”. My head came up straight away and the camera cut the report. I was educated in an Anglican convent as a child and was taught the word of Jesus. So I was immediately on the internet wanting to know what he was about. I found your web site. I knew some of the appalling catholic history but wow were my eyes opened. You have answered so many of my questions I have pondered over the years and I’ve been awake most of the night reading. I was always asking “where did satan go when he was cast out of heaven? It never made sense to me and I had the view that it was symbolic. I feel ignorant. Now I have quantifiable evidence why evil is winning. it can’t continue like this indefinitely. How much worse does it have to get before Jesus returns. Why is it taking so long? Have you ever considered that the Virgin is the Image of the Beast since she seems to be the object of worship that the church has been pointing to for the past 1000 years and more so over the past century? And through her special visitations like Fatima and Lourdes and so many others especially in Latino countries, she has cased many to be deceived. So in that sense she also seems like a false prophet. That’s an interesting perspective Dennis, but the Virgin Mary does not fulfill the description of the earth beast, aka the False Prophet, in Revelation 13. She is simply part of the false salvation message of the antichrist Popes of Rome, which the Jesuits of Rome teach around the world, causing Catholics to revere the Pope. Interestingly it is the Jesuits who created the futuristic false prophecy explanations in the 16th century, to deflect blame away from the Popes, as the Protestant Reformers had rightly identified them as the Son of Perdition of 2 Thessalonians 2, and the antichrist Beast of Revelation 13. I’m very grateful for studies such as this! I’ve been aware for quite some time about the Catholic Church however, this really helps me put it all together in my mind, not just bus and pieces from information all over the place! It’s so very important to know the wiles of satan so that you can fight against him and always keep your faith in Christ! Thank you for providing this study. I’m very interested to learn more. On the bottom of that page is a green Print/PDF button that lets you save the study and print it in an easy-to-read format. I would suggest printing it as a reference. The study pages give the verse by verse explanations. Could you please give me the verse on that? I find the opposite in Rev 16, 19 and 20 where the false prophet is explicitly differentiated from the beast and therefore cannot be the beast. Now the popes and the jesuits can be of the same false prophet spirit as are many evangelical futurists and others. Nicklas, the Popes rose to power out of the 10 kingdoms, thus the water/sea reference. The Jesuits rose to power out of the Vatican, which is the earth that is being referred to. A beast is simply the ruling power. It doesn’t have to be a separate country. The Popes ruled from 538-1798, now the Jesuits are the ruling power. It is declaring that the two entities, the antichrist beast and the false prophet work together, to deceive the world. Is that not what we see happening in Rome? The Black Pope controls the Vatican, and has the White Pope gathering the world under their power. The earth beast of Revelation 13 has two horns, which means that it has two leaders; the Black Pope Jesuit General and the antichrist White Pope, who is now a Jesuit. Who created all of the false prophecy explanations? Was in not a Jesuit, to counter the Reformation? Who spread around the world teaching false gospel, so that now 1.2 Billion Catholics revere/worship the Pope? The Jesuits? Who controls the world via their three city-state corporations of Vatican City, the City of London and the District of Columbia? The Jesuits! When you understand the fulfillment of the bowl judgments, you see that it is the Jesuits who are used to carry them out; once again proving that the Jesuits are the earth beast. As the ‘sea’ is symbolic in this instance, so the ‘earth’ is also symbolic. The only other place I find in the Rev. where the ‘earth’ is used symbolically is ch. 12:16. Verse 14 tells us what the end of this “earth” swallowing up the flood would be a wilderness refuge. Does this not verify the ‘earth’ being the opposite of the ‘sea’ rather than an integral part of the ‘sea’? The 1st-4th bowls were caused by the Jesuits of Rome against the Pope of Rome, and France. They did this because the King of France got the Pope to remove the Jesuits authority and power. They did it out of vengeance, as they never forgive and never forget.